We are making our way to the beautiful Annapolis Valley! 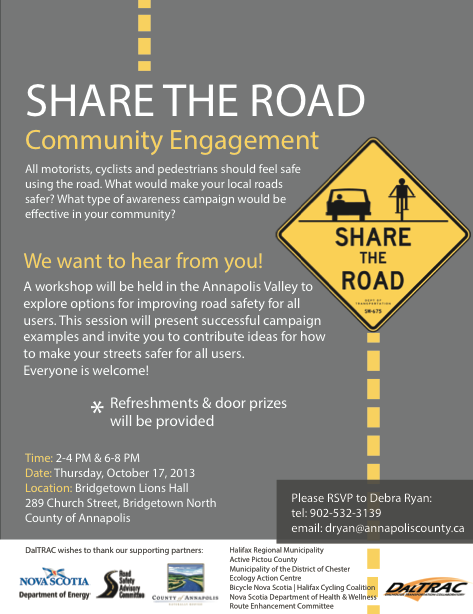 We are very excited to engage with and learn from the community on local road safety concerns, and on what a local Share the Road awareness campaign should look like! Refreshments will be provided, so all you need to do is RSVP and bring your ideas! Where: Potter Auditorium, Kenneth Rowe Building, Dalhousie University, Halifax, NS. The Halifax Cycling Coalition will be hosting a public lecture with Toronto’s Chief City Planner, Jennifer Keesmaat on lessons learned with cycling infrastructure in Toronto, Ontario. For a link to the Facebook Event, click here. 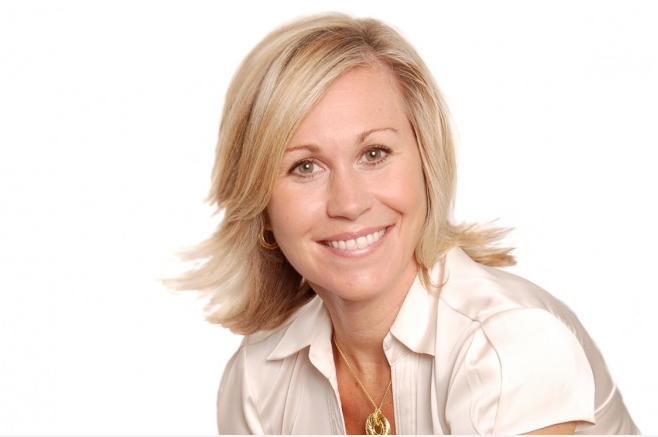 For more information on Jennifer Keesmaat, click here. This training, delivered by Velo Quebec, will provide participants with a thorough understanding of the key steps involved in a bikeway development project. It’s an opportunity to learn the basics of planning strategies, design, analysis, facility selection and security. This training is designed for those involved in planning cycling as a mode of transportation or recreation: transportation professionals, planners and developers, parks and recreation officials, etc. The cost is $150 and includes participant workshop notes, Planning and Design for Pedestrians and Cyclists guide, lunch and nutrition breaks. To learn details about the workshop and to register, go here: http://tiny.cc/2x8m2w. First come, first served. The deadline for registration is Oct. 2 for Sydney and Oct. 4 for Halifax. Checking out Historic sites in Halifax, by bus! Gillian Wesley, the Local Traveller from Halifax, NS is working on a 6-episode video web-series of fun places to get to in Halifax by bus. Past videos have included a Craft Beer Tour, and Beaches and Lakes of Halifax… all accessible by bus!